To better serve the camp community and connect more parents to camps, we've made a few improvements to our MySummerCamps & KidsCamps directory listings. Sign up or renew today & get even more value from your advertising! 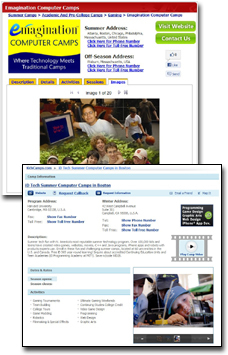 KidsCamps Standard listings now receive a link to their Website at the directory level. Upgrade your Basic or Entry level listing and help more parents find your camp! In addition, MySummerCamps Bronze listings can now take advantage of the Contact Us feature. Parents interested in more information on your camp can fill out a form that will be sent directly to you. We're working on even more improvements and specials for the forthcoming season. Be sure to watch this blog for more news! Take the MySummerCamps / KidsCamps User Feedback Survey! Time to tell us how we're doing! Complete our MySummerCamps / KidsCamps User Feedback Survey and you'll be entered into a giveaway for a chance to win a DVD Player & a copy of A Cinderella Story: Once Upon a Song on DVD. 25 second place winners will win a copy of the DVD. Your responses are 100% anonymous and will help us improve our offerings and better serve the camp community. Take the survey today! It's a musical twist on an enduring classic! Katie (Lucy Hale of Pretty Little Liars) dreams of being a professional singer but is continually thwarted by her cruel stepmother (Missi Pyle) and stepsister (Megan Park). Katie falls hard for the handsome new boy (Freddie Stroma) at her school, but when her stepsister takes credit for Katie's singing and Luke falls for the wrong girl, Katie must learn to stand up for her dreams. A Cinderella Story: Once Upon A Song © 2011 Warner Bros. Entertainment Inc. All Rights Reserved.